Posted on June 1, 2017	by H.P. My exposure to Brackett had been all of one short story, but for some reason I’ve long associated her with Edgar Rice Burroughs. After reading these two novellas, I think the better comparison is to Robert E. Howard (more on that in a bit). Whoever it is, I have no doubt that Brackett deserves to stand with—or above—either. That lady could spin a damn yarn. And Eric John Stark can stand with Tarzan or Conan. I have two copies of these two novellas collected. 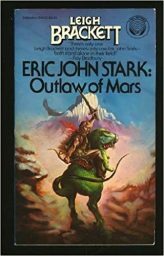 The first is a Ballantine edition titled Eric John Stark: Outlaw of Mars. The second is an Ace Double with The Secret of the Sinharat reading one direction and People of the Talisman another. Want a copy? I have a giveaway running through June 5th. The two novellas stand alone, but each follows the Mars adventures of Eric John Stark, an earthman raised on Mercury. The Secret of the Sinharat opens with Eric John Stark on the run and losing the race. The men who catch him give him an ultimatum: either turn informant or do hard time on Luna. Stark has been contracted to train Martian provincials looking to make a move against their betters. Throw in another merc with a personal enmity and Stark is cooking with gas. People of the Talisman opens with Stark trekking north with a friend on his last legs. Said friend wanted to return to the city of his birth to die. He has a guilty conscience; he stole the talisman of his people before leaving. A talisman that the people of the city, and the barbarians that surround them, believe protects the city. Balin stood frozen, his borrowed sword half raised. He saw Stark hurl the warrior bodily off the Wall and heard the cry as he fell, and he saw Stark’s face as he grasped the ladder and shoved it outward. There were more screams. Then there were more ladders and more red-haired men, and Stark had found a sword and was using it. Balin smelled the blood, and suddenly he was shaken with the immediacy of it, the physical closeness of an enemy come to slaughter him and destroy everything he loved. A fever burned through him. He moved forward and began to chop at the heads that appeared over the Wall. But it was as Stark had said, and at first he found that it was easier if he did not look too closely into their faces. Because of this one of them got under his uncertain guard and almost gutted him. After that he had no more difficulty. I’ve read that passage dozens of times now and it never gets old. You could teach an hour-long class in creative writing on that paragraph alone. The spare language, with nary an adjective to be seen. The mix of long and short sentences. The judicious use of polysyndeton, the repeated use of conjunctions. Writing on war as good as anything Hemingway ever wrote. Stark shivered, with more than the cold. He hated cities anyway. They were traps, robbing a man of his freedom, penning him in with walls and the authority of other men. They were full of a sort of people that he did not like, the mob-minded ones, the sheep-like ones and the small predators that used them. Stark is much more Conan than John Carter. I’m not a gamer, but if you’re looking for an inspiration for your barbarian class or character, I would start with Stark over the Arnold Conan movies. Stark isn’t uncivilized, but he isn’t civilized either. Frequent references are made to Stark’s almost sixth sense to recognize danger on the horizon. Brackett suggests that humans were seeded across the solar system in our dim past, with earthmen only discovering their brethren after setting out for the stars. Science fictional weapons exist, but Stark spends his time in the hinterlands where conflict is more likely resolved by sword and spear. Stark never forgets his colonial roots. In exploring that, Brackett makes more modern efforts like Ann Leckie’s in Ancillary Sword look simplistic and crude. 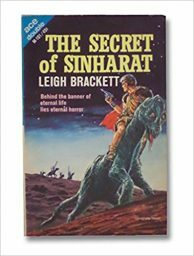 Leigh Brackett was maybe the last great sword & planet writer. She also wrote hard-boiled mysteries and movie scripts, and it shows. She may not have Burroughs’ imagination, but her command of pacing and suspense, her grasp on the story structure, is virtuoso. Oh, and that final sequence in People of the Talisman? I have to think it majorly influenced the Finn from The Wheel of Time well beyond the fae source material. George T. Dodds on The Secret of the Sinharat and People of the Talisman at SF Site. Sandy Gerber on The Secret of the Sinharat and People of the Talisman at Fantasy Literature. PC Bushi on The Secret of the Sinharat at PC Bushi. Alan Brown on The Secret of the Sinharat and People of the Talisman at Tor.com. Throwback SF Thursday: The Secret of the Sinharat and People of the Talisman was originally published at the Castalia House Blog. This entry was posted in Book Reviews, Fantasy, Science Fiction, Throwback SF and tagged Heroic Fantasy, Sword and Planet, Vintage SF. Bookmark the permalink. My favorite book by Brackett is The Sword of Rhiannon, but any Stark story is a good read. Too many people have never read Leigh Brackett; I think they are the poorer for it.